Being able to draw this card off the Surveil you ditch it with is so incredibly unintuitive to me. Except you can’t...as it’s still in your library when you do that surveil. My best guess would be that the rules check for "when you surveil" triggers at the end of the surveil action, at which point this card is in your graveyard and can trigger. Example: Two creatures are on the battlefield along with an artifact that has the ability “Whenever a creature dies, you gain 1 life.” Someone casts a spell that destroys all artifacts, creatures, and enchantments. The artifact’s ability triggers twice, even though the artifact goes to its owner’s graveyard at the same time as the creatures. Ignore the exceptions, because this falls under the normal case. 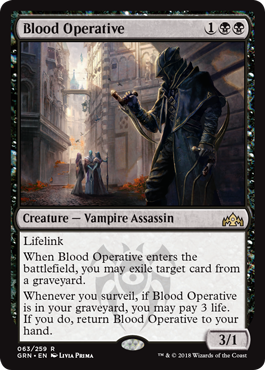 After you surveil, the Blood Operative in your graveyard is a new object, so it checks to see if the event that created it triggers any of its triggered abilities.